Milan attraction-guides.com - Milan, Italy attractions guide Milan Meazza (San Siro) Stadium information about attractions, Giuseppe Meazza, history of construction, Leonardo da Vinci horse sculpture, location and address details, Via Piccolomini, tel / telephone number, general tourist information about Meazza Stadium (San Siro) in Milan (Milano) area, Italy (Italia) IT - Last updated 30/10/2012. Milan's Meazza Stadium is named after Giuseppe Meazza, a famous Italian footballer who played for both the Inter and Milan city teams. The Meazza (San Siro) Stadium was originally constructed in 1926 and has since been rebuilt and thoroughly renovated. With a capacity of around 85,000, the Meazza (San Siro) Stadium is Italy's premier stadium. The Meazza (San Siro) Stadium is also often referred to as San Siro, after the surrounding district of Milan. 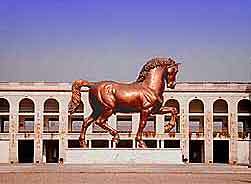 Attractions at Milan's Meazza (San Siro) Stadium include an enormous sculpture of a horse that was created in 1999, standing between the Meazza Stadium and the nearby San Siro racetrack. The horse was designed by the famous Italian artist Leonardo da Vinci, who never found the time to actually create it himself.